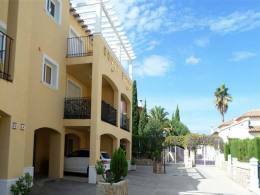 For sale close to the La Marina beach in Denia, this immaculate ground floor apartment with a 30 m terrace. Security gates leading onto a path that will take you to the apartment block into a corridor to the front door. The front door leading into a hallway with a family bathroom and two double bedrooms on the left and a master bedroom with fitted wardrobes and a modern en-suite bathroom with a walk-in shower. Straight ahead is a spacious living and dining room and a well equipped independent kitchen with a utility room. From the living area, Frech doors opening up to the 30 m terrace, a great area to relax. A small gate opens onto communal gardens and a large swimming pool. The property also benefits from hot and cold air conditioning and a private garage space. 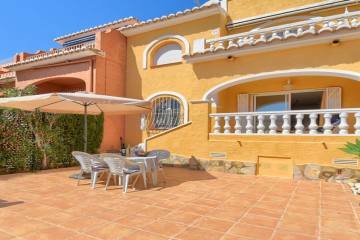 Walking distance to La Marina Beach and restaurants and shops.